Some good news and a bit of history…. I won’t bore you with telephone and email exchanges between me, loss adjuster and cleaners and scaffolder except to report that something is going to happen. The scaffolder has promised that he will contact me next week and then arrange to install the scaffolding in the theatre auditorium. This will take a couple of days. I will then inform the cleaning company and ask them to arrange to come in and clean the walls and ceiling etc. and hopefully get rid of the still dreadful smell. So at least there is some movement ……. And now a bit of reminisence. Eric Bramall, as a boy started building his first puppets during the years of World War II and often told me how scarce were materials and resources. He recalled that little was wasted and most things were recycled. He said carving wood was impossible to buy so the only chance of getting hold of seasoned wood was from old furniture or perhaps look out for old gate posts being replaced. When he died, 50 years after the end of the war, I found a couple of logs of fruit wood under his bench, layed down when green and set aside for use when seasoned. He also told me how lucky I was to be able to pop along to a ironmongers (hardware shops which are now largely extinct) and buy a vast assortment of adhesives, nails and screws and fittings. In the war years even the basics were in short supply. I remember when I was a boy screws were never thrown away and even old nails were carefully extracted and straightened if bent and carefully stored for re-use. 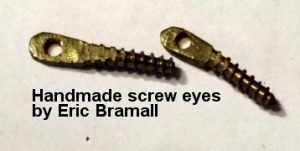 Eric said that screw eyes, especially small sizes, were impossible to find and it was a few years before they came on the market again. Now screw eyes are essential for marionette making and so puppeteers had to make their own. This whole reminisence was triggered by my finding yesterday in an old box of mixed screw eyes two that were obvious examples of his work. They have apparently started out as two brass screws with their heads sawn off. The shank has been hammered out, flat and wide enough to drill a hole of a size to take the linen carpet thread which was used for marionette strings. Since there are a minimum of eleven stringing points on one puppet quite a few hours must have been spent in just fashioning the screw eyes. Posted on 30th November 2017 30th November 2017 Leave a comment on Some good news and a bit of history…. Can you believe this ….. The cleaning company based in the Midlands arranged a date and time to come to North Wales and meet the local scaffolder, but they did not bother to inform me either that the date was confirmed or that a time had been arranged. Of course I missed them! Luckily I arrived at the theatre and realised there had been a phone call, but no message had been left. Out of curiosity I decided to do a call back on the number and discovered it was the bloke from the cleaners on his way home! Anyway he turned back, and the scaffolder was recalled and we all met up at the theatre. Unfortunately the cleaning representative, a very nice chap, couldn’t really contribute much. He had driven from North Yorkshire which was his patch and was only standing it for the agent who covers my area but who wasn’t available. He explained that he didn’t actually know what was required, or what was planned, since it wasn’t his job and he knew nothing about it. The scaffolder agreed that he could put up appropriate scaffolding over the seats, without removing the seats, thus confirming what I had told them back in August. So after all these months it seems thaat we haven’t moved one iota forward. That was all over a week ago but I haven’t heard anything from anybody. Posted on 18th November 2017 Leave a comment on Can you believe this ….. The Cleaning Company telephoned yesterday to fix a date to re-inspect the theatre in the company of a scaffolding contractor. They already inspected the theatre in early August. They suggested a date, but not for another 10 days. Apparently that was the earliest possible for them – and this only if they could get the scaffolding contractor for that date. They hadn’t even contacted him to check. I am still looking forward to Christmas, for although I won’t be opening the Harlequin on Boxing Day I will still be taking my Magic and Punch & Judy into schools and nurseries in the weeks up to Christmas and I do so enjoy that. And of course there’s also the occasional birthday party which is always fun.